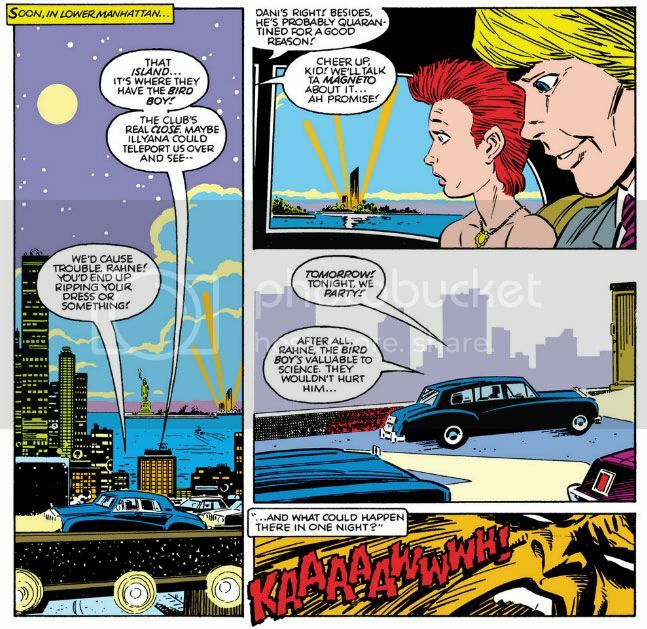 From the vantage point of our current mass media, where its characters permeate the zeitgeist, it may seem ridiculous, even the stuff of lunacy, but there came a time in the late 1980s when America's comics-hungry masses turned away from New Mutants. As interest in the comic fell and sales flagged and talking heads hit the airwaves to postulate almost hysterically on the reasons-- anxiety over the ending of the Reagan era? Pre-millennial jitters?-- series star Dani Moonstar phoned the home office and demanded someone at Marvel do something. The Marvel solution as scripted by Louise Simonson was to honor that most wonderful and time-tested of sitcom traditions with the addition of a cute tagalong to the familiar cast. In the human world, this new character would most likely be a baby or even Ted McGinley (already having done sterling work on Happy Days, The Love Boat and at the time coming off a stint revitalizing Dynasty as Clay Fallmont on his way to achieving legendary status as Jefferson D'Arcy on Married With Children). Or a bespectacled blond-headed moon-faced boy susceptible to both pies in the face and Bobby Brady's ridiculous detective schemes. In the world of teen mutant super-beings, the ideal Cousin Oliver proved to be a hideous feathered freak, the very antithesis of the almost supernaturally handsome McGinley. And while The Brady Bunch failed to escape the event horizon of its particular ratings black hole, adding Bird Brain to the cast gave New Mutants enough of a lift to carry on for a few more years. Bird Brain, the lovable weirdo. Bird Brain, who made Gonzo the Great look like Cary Grant and the Chicken Lady from Kids in the Hall resemble his To Catch a Thief co-star Grace Kelly. Bird Brain, who ate fish and probably smelled something awful. 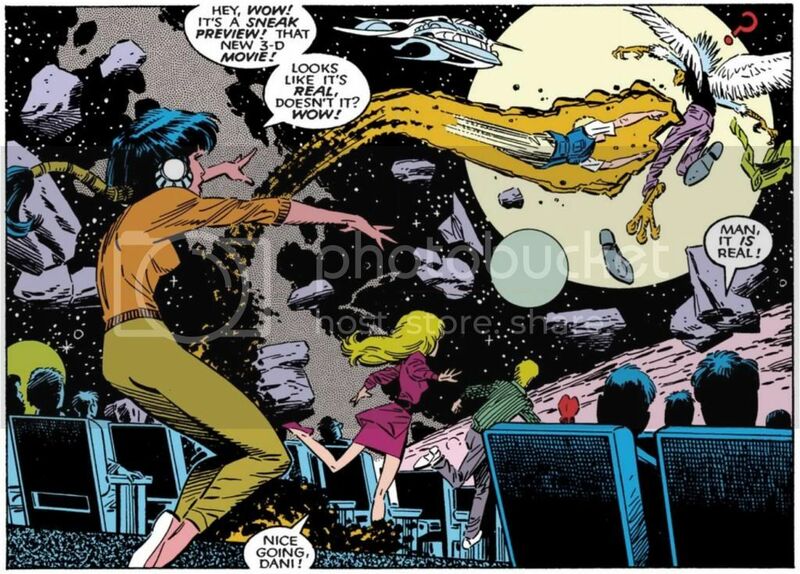 Online sources list New Mutants #55 (September 1987) as Bird Brain’s first appearance, and that's technically correct, although it's a mere cameo. We do feel his presence throughout, starting early in the issue when the kids learn about Bird Brain from a radio news story. Remember radio? Artist Bret Blevins reminds of what this obsolete technology looks like with a highly detailed rendering that will no doubt become useful for future historians and archeologists as they try to recreate our late 20th century society. To you, highly advanced people of the future: Yes, we primitives once used these devices to listen to music and learn about the world around us. Later, Rahne urges her friends to do something about Bird Brain's plight, and Bird Brain himself appears in an insert panel soon afterwards. All we see is his beaked face. Most of the story involves Sam Guthrie taking drugs at a party to impress his sometimes lover Lila Cheney, a space-thief who spends her down time rocking earth as a kind of Patti Smith/Pat Benatar/Joan Jett stand-in. For the record, I would fully support a Lila Cheney solo series. Anyway, Bird Brain. 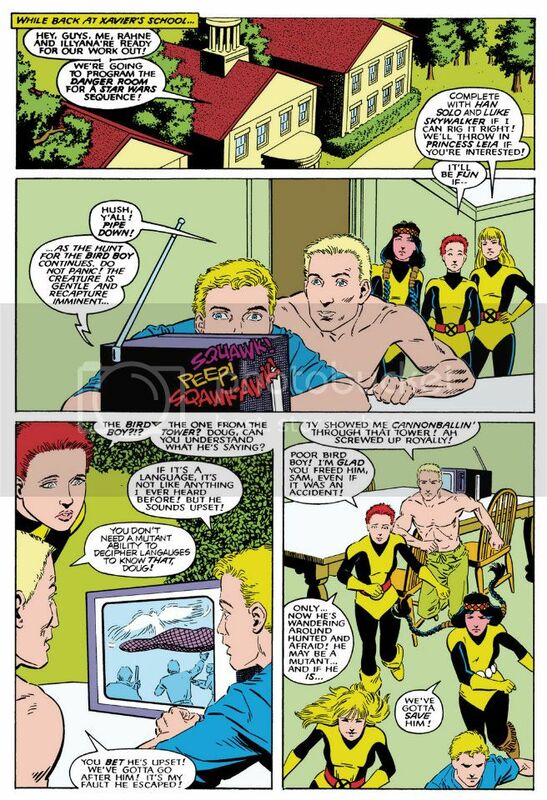 New Mutants #56 (October1987) is the first comic truly to be all about his birdness and his brain. We learn Sam has somehow inadvertently freed Bird Brain from his imprisonment in a research lab—it must have happened while he was groggily flying around trying to avoid some aliens who have it in for Lila. For unknown reasons, we don’t actually see this happen in the story. Just take Dani's word for it. Or Sam’s. Or Rahne’s. Whether or not he's truly responsible, Sam feels so and goes to find the fugitive freak while Dani involves the entire team. She even makes them wear their hideous “graduation uniforms,” for disguise purposes. See, if they wore their New Mutant garb, everyone would know them, but a group of teens with identical powers and similar appearance in different clothes constitute a mystery even Reed Richards couldn’t solve. And that guy is a genius, but obviously not as much so as Dani Moonstar. Let me just take a moment to express how much I wish June Brigman had penciled more New Mutants. She did this issue and annual #4 (September 1988), but Marvel should have given her the monthly assignment. She’s gold on this team, especially with Simonson's scripting. Regular artist Blevins has an edgy, sketchy style with a lot of energy, but he makes Dani look about fifty years older than her supposed age (and kind of mean! ), which is an unforgiveable lapse (although his Rahne Sinclair is cute as a button). So while I admire Blevins' cartoony body language, with bent knock-kneed poses and dramatic gestures, I prefer Brigman's cleaner visuals and more controlled rendering. Brigman, with the able assistance of inker Terry Austin, provides a sleek look that's a cool alternative to Blevins' more jittery work. Her storytelling is fine, but it's the way she draws figures with lifelike proportions and impeccable facial “acting” that grounds the book in some much-needed reality. This gives outré characters like Bird Brain a bit more believability. And this is without relying on the crutch of photorealism. Also, Louise Simonson has a way with naturalistic teen-speak that I find superior to Chris Claremont's more stilted dialogue. Claremont crafted some dark classics during his run on the characters, particularly the "Demon Bear Saga," which received its own trade paperback collection (something that can't be said for the "Bird Brain Saga"), but Simonson's teens "sound" more like actual teens. Especially when combined with Brigman's art, where they look like actual teens as well. Also, Simonson's Bird Brain certainly is a bird brain! It doesn't take Dani and the rest long to teach him the importance of dressing well. And the deliciousness of fast food. And the wonders of modern cinema. At this point, I will excuse you for asking, "Just what in the name of Bill Sienkiewicz is going on here?" In fact, ask me that. Right now. I don't know! 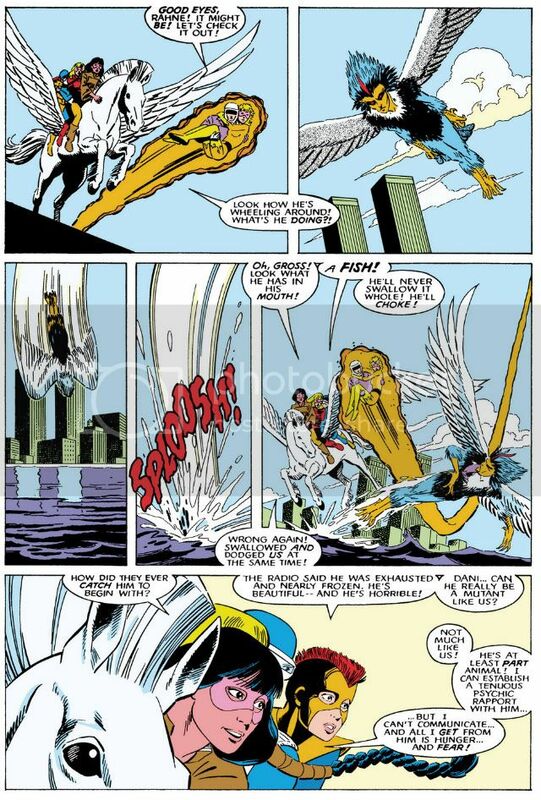 As a minor character Bird Brain would have been slightly annoying, but Simonson spotlights him over Dani Moonstar and other, more pressing plotlines like Sam's romance with Lila, Magneto's taking over the team and Amara's love-hate for one of the Hellions and her resulting arguments with Dani. The kids' clumsy attempts at assimilating so alien a creature into teen society are amusing, but this is also a comic co-starring a girl who's literally from Hell and characters just one mistake away from death. And the "Bird Brain Saga" isn't just a one or two issue romp. It lasts approximately seven issues and for most of those seems little more than slapstick sit-com fodder, a bizarre digression for the series as a whole. Okay, actually, I do know. Because just when you've had about all the Bird Brain you can stand, Simonson ups the dramatic stakes by adroitly shifting tonally from comedy to sci-fi horror and the plot into a Moonstar-starring H.G. Wells' The Island of Dr. Moreau. This happens in New Mutants #58 (December 1987) when the kids journey to a mysterious island to finally learn the true origin of Bird Brain. After all, Bird Brain had to come from somewhere, so why not an island of animal-human hybrids presided over by a mad scientist with a skull for a hat? By #59 (January 1988), the New Mutants are themselves captives and their humanity at risk. From there, the jeopardy growing from this development leavens the oddball comedy of the preceding issues. The Moreau-style plotline is also particularly apt when dealing with characters on the cutting edge of human evolution. Wells' themes--- including cruelty to animals (in Moreau, it's vivisection, in this story it's updated for the 80s to a more generalized laboratory research and then genetic splicing), which the Bird Brain story addresses obliquely from the beginning-- jibe quite well with Simonson's take on the team as concerned young people trying to make the world a better place. By providing a classic literary explanation for this bizarre Bird Brain character, she finishes strongly, with a tragedy with lasting ramifications for the team in #60 (February 1988). Which I won't share with you because you owe it to yourself to read the entire Bird Brain saga in all its strangeness. It's not exactly a "Demon Bear Saga," but on the other hand, it does feature Bird Brain.